Recently, I was honored to join the President, First Lady, and other Members of Congress for a trip to Cuba to usher in a new era in Cuba-U.S. relations. During the trip, we had the opportunity to meet with members of civil society and U.S. business leaders to have conversations on what the next steps are for Cuba and the United States. 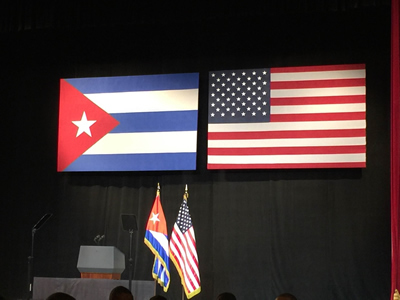 The Cuban and American Flags side by side. It was remarkable to see the American flag and the Cuban flag flying side by side for the first time in over fifty years. That is progress. One of the highlights of the trip was an exhibition game between the Cuban national team and the Tampa Bay Rays. The baseball game was significant because many famous Cuban players in the MLB had to defect and leave behind their families in order to get signed with the league. We are not naïve about ongoing issues with the Cuban regime, but our evolving relationship with Cuba is designed to help the Cuban people become entrepreneurs and to connect to the world. Any change in Cuba must come from the island, and what we saw is that people on the ground are ready for change. Normalizing relations between our governments is one of the last remaining pieces of the Cold War. 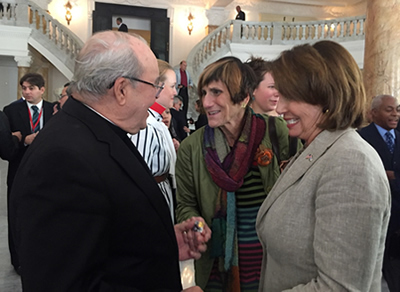 Discussing my work in Congress with Cardinal Lucas Ortega in Havana. I have been on several trips to Cuba with Congress and have long advocated that we need to change how we interact with one of our closest neighbors. In 2007, I led a bipartisan Congressional delegation to Cuba to explore agriculture trade opportunities. Cuba currently imports approximately 80 percent of its food. This presents an enormous trade opportunity for American farmers. I am also a founding member of the bipartisan Cuba Working Group, which convenes meetings with leading experts on Cuba and foreign affairs, hosts policy roundtables and discussions, and raises attention to how reforms in the U.S. and Cuba are opening new opportunities for commercial, diplomatic, and people-to-people relationships. The United States’ Cuba policy is decades out-of-date and it is clear that the best way to bring democratic change is through economic participation and inclusion. It is positive that we are finally taking some commonsense steps to normalize relations between our two countries. Congress should follow the President’s lead and end the Cuban embargo.